Snow Performance Diesel Stage 1 Boost Cooler UNIVERSAL - Dezod Motorsports Inc - Home of the automotive performance enthusiast since 2002. 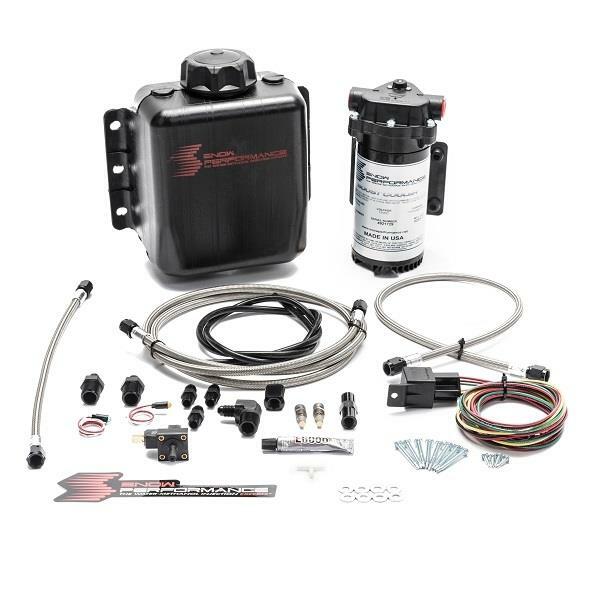 Decrease EGTs and increase HP in your diesel by 65HP+ in the most cost effective water-methanol injection kit on the market! Utilizing a adjustable boost pressure switch and dual nozzles to deliver precise amounts of water-methanol once 30 boost PSI has been reached (Boost Engagement Adjustable, 30 PSI Boost Hobbs Switch Included). Recommended for all high boost and competition diesels looking to increase HP while decreasing EGTs when on heavy throttle. Comes with easy to mount race ready 3QT, high flow check valve, braided stainless steel line, 300 PSI UHO Pump, and LED alert system.